A tenacious rover/tagger who gave everything for his jumper, Chris Bond gave great service to five clubs over a journeyman 13-season career. Born in 1969, Chris Bond’s first taste of senior football came with Wynyard, making his debut in 1987 aged 18. Despite his youth, his talent was already obvious, and after another season with Wynyard Bond headed south to join North Hobart in the TFL in 1989. He spent only one season at the Demons, but it was a stunner, featuring in North Hobart’s premiership win and being chosen to represent his state against Victoria. At season’s end many VFL clubs were keen to sign him, however it was Carlton – who had courted Bond two years earlier with an invite to the 1987 Grand Final – who snared the young star, selecting Bond with Pick 35 in the 1989 National Draft. After a dominant display for Carlton’s reserves in Round 1 of 1990, Bond made his senior debut for the Blues in Round 2. He would appear four times at senior level that season, and ended the year as a member of Carlton’s reserves premiership team. 12 games in 1991 seemed to indicate that Bond was solidifying his position at senior level, however the recruitment of Greg Williams in 1992 and the form of players like Bradley, Gleeson and Brown saw Bond’s midfield opportunities dry up, and after only 22 games in three years he quit the Blues at season’s end. Keen to continue his football career elsewhere, Bond signed with SANFL club Central District, however friend and former Carlton teammate Ian Herman convinced Bond to stay in Victoria, and he eventually joined Richmond via the 1993 pre-season draft. After 10 senior appearances in his first season with the Tigers, 1994 was Bond’s break-out season at AFL level. He played all 22 games, finished fifth at the Tigers for disposals (356), polled eight Brownlow votes and most impressively took out the Jack Dyer Medal as Richmond’s Best and Fairest, the first Tasmanian to win the award since Royce Hart in 1972. Bond was an ever-present member of the Richmond sides of the mid 1990’s from then on. Despite often being utilised as a tagger he still occasionally managed to find plenty of the ball himself, such as a 32 disposal, one goal effort against Hawthorn in 1996. After missing just one game from 1994-97, and also playing three State of Origin matches for ‘The Allies’ in that time, Bond was traded to Fremantle after the 1997 season in exchange for Pick 2 in the 1998 draft. Fremantle’s midfield had lost experienced duo Scott Watters and former captain Ben Allan after 1997, and so it was hoped that the addition of Bond and fellow Tasmanian Adrian Fletcher would bolster the Dockers inexperienced midfield. Bond didn’t miss a beat in his first season in the west, playing every game, finishing fourth in the Dockers Best and Fairest. He was named captain for the following season, however Bond’s form in 1999 was well below par, and after Fremantle finished second-last on the ladder Bond was controversially sacked by the club, and he subsequently retired after 163 AFL games. 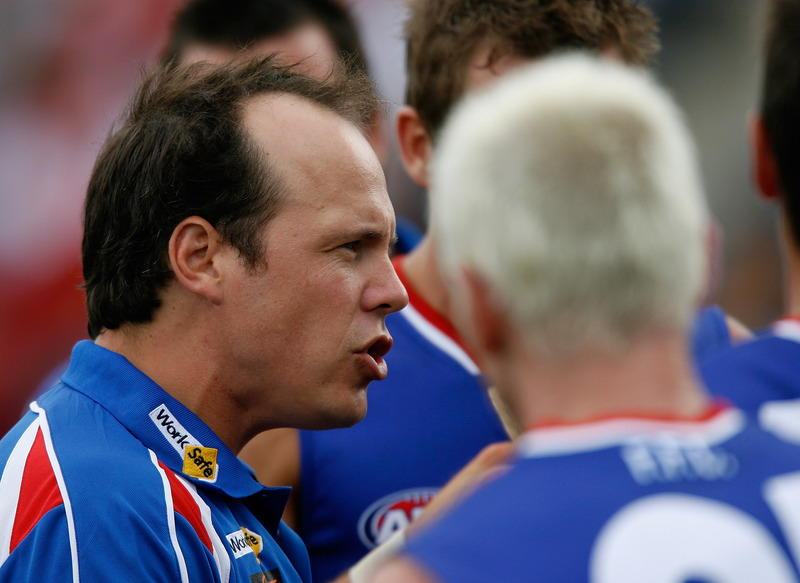 After retirement, Bond joined the Western Bulldogs as an assistant coach in 2000. The following season he was appointed senior coach of VFL club Werribee, and would guide the Tigers deep into the finals in both of his two seasons at the helm. After continuing at the Bulldogs until 2008, he returned to Fremantle as General Manager of Football Operations in 2009, a role he performed with distinction for nearly ten years.